In the form, there can be even graphical displays, e.g. colored bars. Further, there can be multiple graphical diagrams for showing things like reflection spectra. It is important to note that the forms and the underlying calculations are not hard-coded. You obtain script files, i.e., text files which define a multilayer structure, all the calculations and the generated graphical diagrams, and (optionally) a custom form. The user interface of the software provides powerful editors and a lot of additional helpful features for modifying such scripts or developing new scripts. 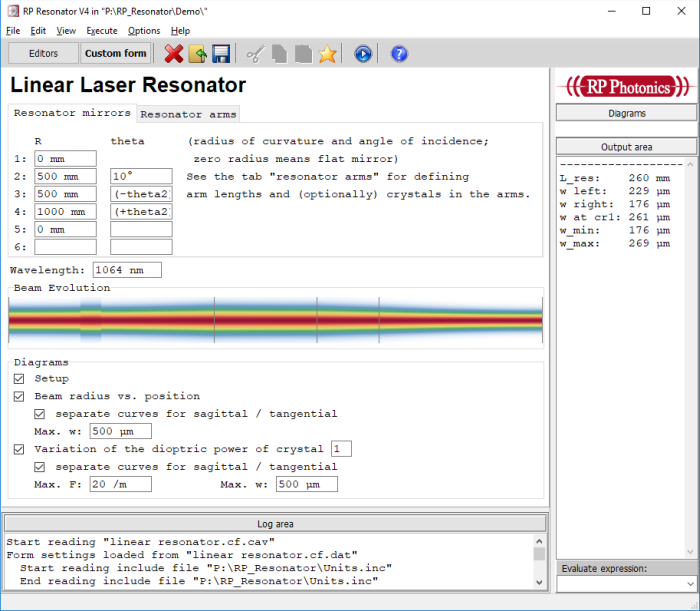 The resonators (or any single-pass optical arrangements) can be easily parameterized instead of using simple numerical values for various properties. That means that their properties are calculated from a set of given parameters. That is often highly convenient in practical work. For example, you can specify the total length of a resonator arm and that of a laser crystal, which is to be placed in the middle of that arm. The length of the passes in air left and right of the crystal can then be automatically calculated. One can produce parts of optical setups with a loop, for example for repeating certain sequences of optical components with a variable number. 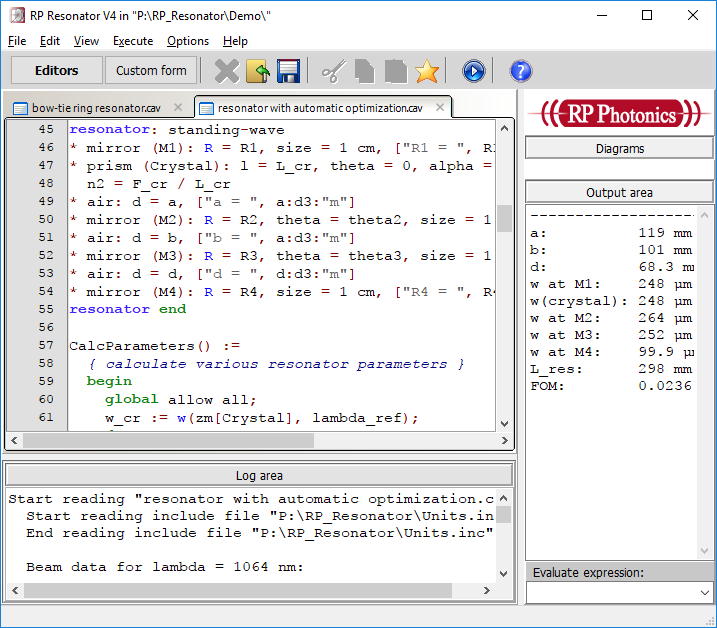 RP Resonator allows you do do optimizations with arbitrary mathematical forms of the figure-of-merit function. Other programs normally only allow one to enter parameters of a predetermined figure-of-merit function. 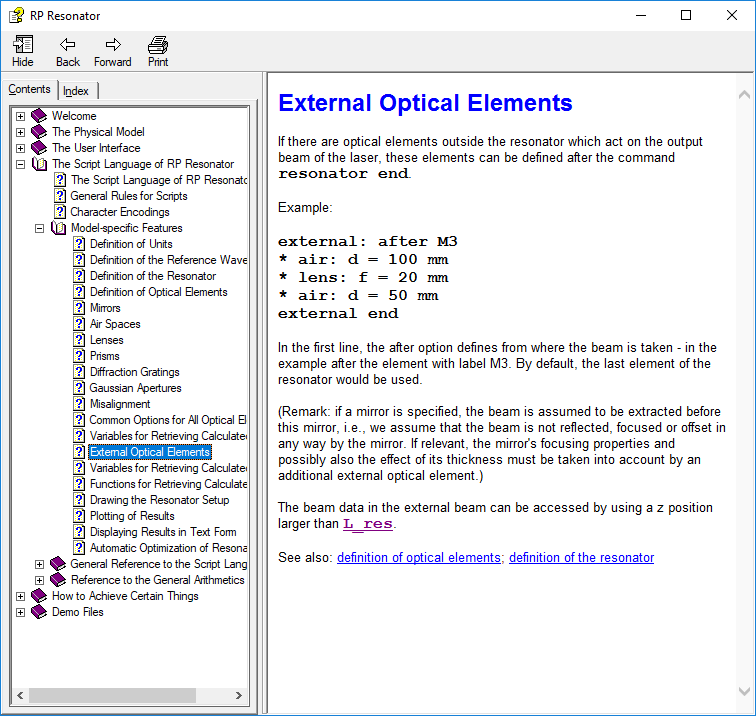 You can easily implement additional calculations – for example, average quantities over some angular ranges or check effects on ultrashort pulses. You can create essential any kinds of graphical plots for analyzing the results – not just choose from a defined set of diagrams. Since V3, one can even define a custom form in a script (see below). This feature allows one to combine the enormous flexibility of the script language with the nice handling of forms for input and output of data. 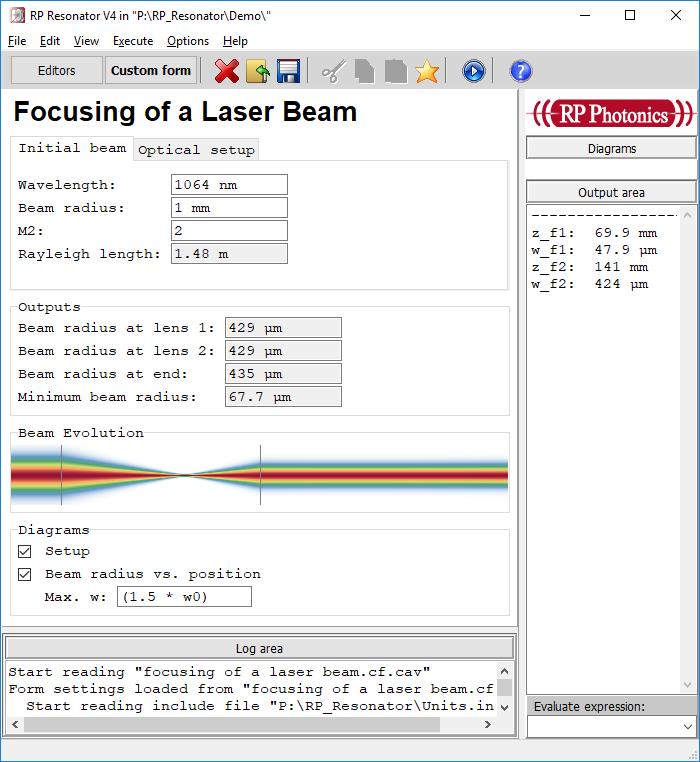 Here, the arm lengths are simply defined with numerical values, but the dioptric power of the laser crystal is given as a parameter which can be varied, for example, in graphics. 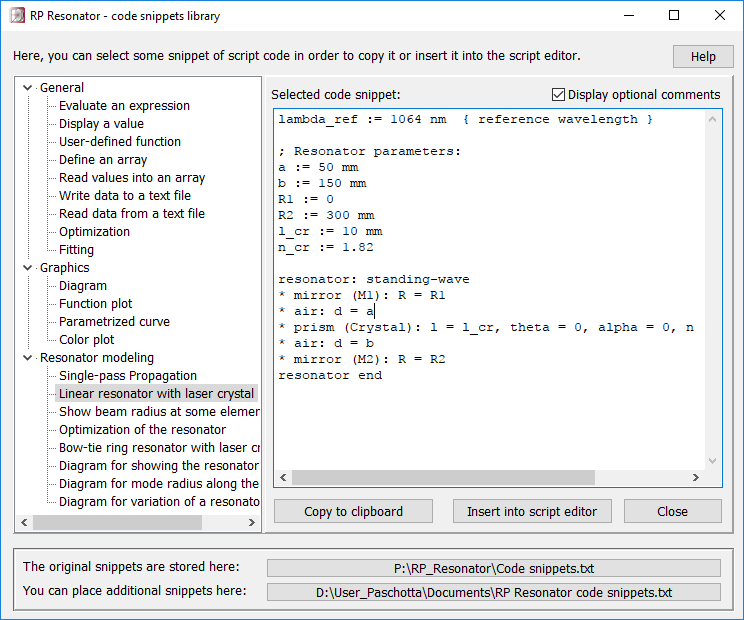 You can simply copy and paste parts of the provided demo files, or of your earlier script files, in order to reuse code. Let substantial parts of the required scripts be generated based on form inputs (see below). 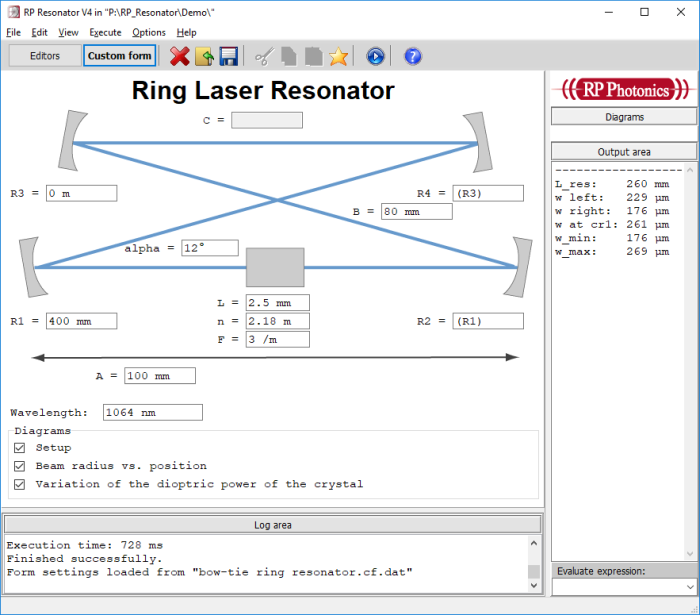 In complicated cases, RP Photonics can send you some lines of code. The scripting approach is extremely flexible, allowing you e.g. to systematically vary certain parameters, import and export data in various formats, set up new types of diagrams, or mathematically process data. A script file perfectly documents your work. When you read it later on, you easily see what you have done. You do not need to remember e.g. what settings you have done in some interactive windows. Your script can define one or many different types of diagrams for visualizing the results of the calculations. Examples are shown on the pages for various example cases. 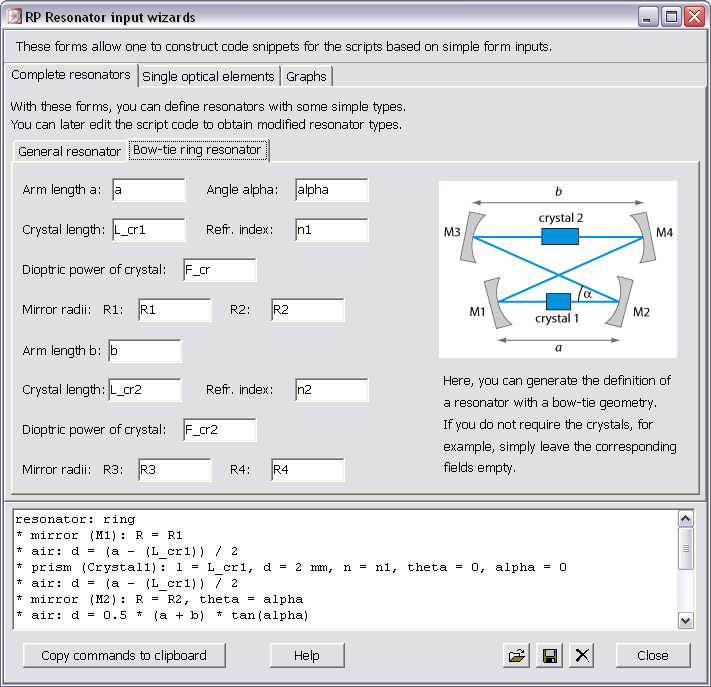 Each diagram is shown in a separate window. 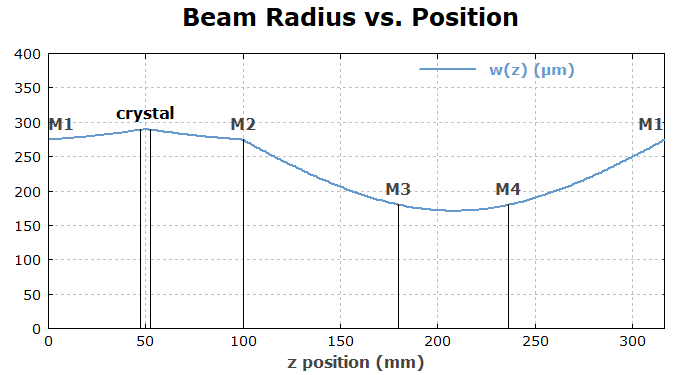 Below you see an example of such a graphics window, showing the beam radius vs. position within a resonator. There is a manual in PDF format, explaining in detail (on about 40 pages) the principles of the physical model, the user interface, the script language, etc. The context-sensitive online help function is even more comprehensive. See the screen shot below to get an impression.